Critical Resistance needs your support to keep our work strong and vibrant. Read our 2018 Midyear Letter here. See 2017 Financials basics here. Did you know? Being a donor to CR has its benefits. Click here to see and listen to our Donor Webinar and Call archive. Becoming a donor to Critical Resistance is a straightforward way to keep CR strong. 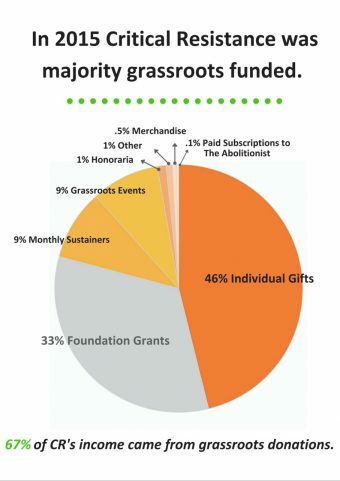 In the past few years, you have helped us intentionally and successfully transition from being funded primarily by foundations to being funded primarily by grassroots donors like you. Grassroots donations now provide 67% of our total budget, which increases our financial stability and shifts more power and leadership into the hands of our local members. 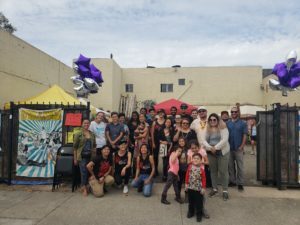 Where your donations go: Your donations help sustain our organizing to stop prison construction, to mobilize communities impacted by the violence of policing, and to develop alternatives to punishment and repression that sustain the health and well-being of our families, neighborhoods, and communities. Any amount directly supports practical and visionary organizing towards abolition. Donations of money, time, and other resources help propel our work forward. Click here to donate today. Email or call us at 510.444.0484 to donate time or resources. 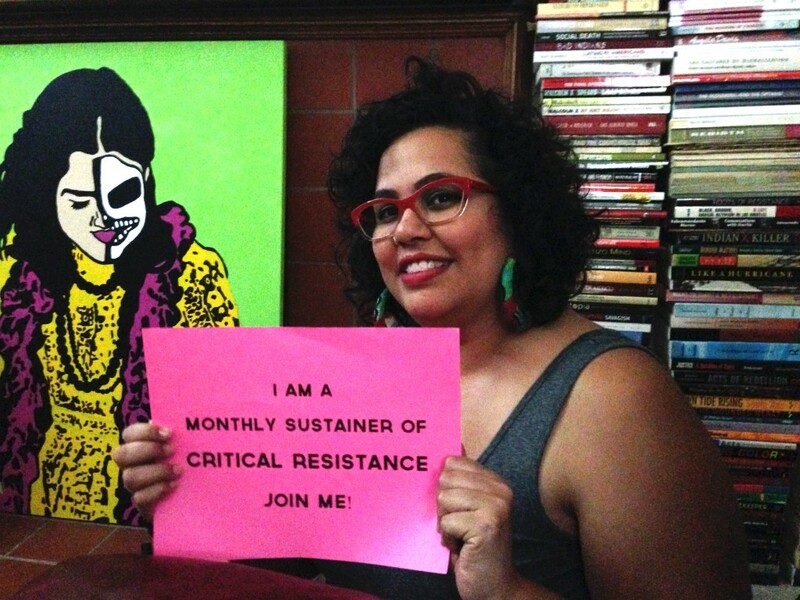 To help support Critical Resistance’s ongoing projects and campaigns, consider making a recurring monthly gift. This support sustains us throughout the year and is a wonderful way to spread out your giving over time. You can become a monthly sustainer online or through your workplace giving program. 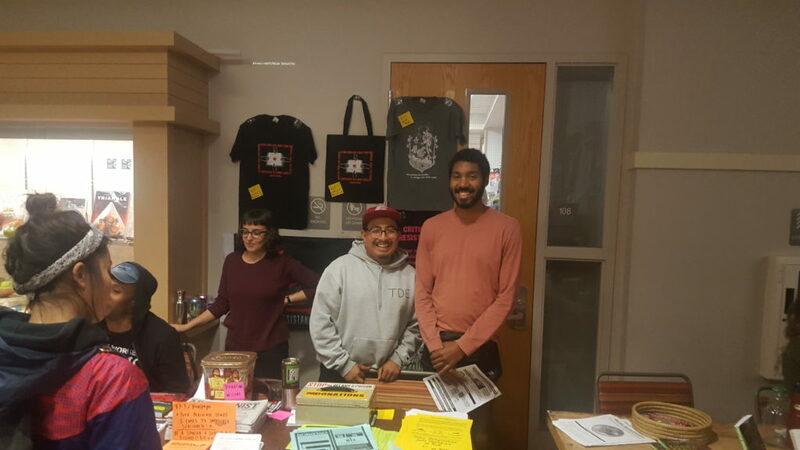 A community fund of Critical Resistance Oakland established to support community members in need. Click here to learn more. 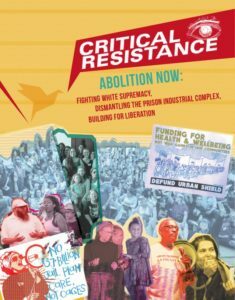 Making a gift to Critical Resistance in the name of a loved one or comrade is a sweet way to acknowledge a connection your community may have to Critical Resistance and supports all that we do. If you would like to offer a gift in someone’s name in celebration of a birthday or special event or in their memory, simply complete the donation form and let us know who the gift is in honor or memory of in the “Special Purpose/Dedication” field. If desired, you can request that we notify the family, individual or organization. We are happy to send a note letting them know that you have made a gift in their name. If your company has a matching gift program, you may be able to increase the value of your gift. If you have given a gift recently or in this calendar year, it may still be eligible for your company to match. Workplaces also often have giving programs that can facilitate monthly donations. Please check your personnel department for the matching gift form, send it in to Critical Resistance to increase your gift, and check to see if they can help you with ongoing monthly contributions. A generous way to support Critical Resistance in the future is by remembering us in your estate plans. You can do this by simply including Critical Resistance as a beneficiary of your will or living trust, your retirement plan, bank account or in your life insurance policy. For more information about legacy giving or to let us know that you have already named Critical Resistance in your estate plans, please contact Jess Heaney, Development Director, at (510) 444-0484 or jess@criticalresistance.org. If you have a car, boat or RV that you no longer use, consider donating it to benefit Critical Resistance. We work with a reputable car donation processor, Charitable Adult Rides & Services (CARS, Inc.), who will make all the arrangements at no cost to you. They handle the title transfer requirements and will provide you with a tax deductible donation receipt when they pick up your car. You can use their donation page here. Call CARS, Inc. at (855) 500-RIDE or Jess Heaney, Development Director, at (510) 444-0484 or jess@criticalresistance.org. Parties, dinners, BBQs or an art/bake/goods sales are great ways to support Critical Resistance and build the movement for abolition. You can bring together your friends, neighbors, coworkers, or community group to celebrate and raise some funds to dismantle the prison industrial complex! Check out our “Tips for House Parties” packet (linked here and image, right). Don’t forget: CR can help support you with any or all of these steps! Email Jess@criticalresistance.org to let us know what you are planning, to learn more or plan your party. Did you know that every sale of CR gear supports our organizing? Merchandise purchases are grassroots contributions too! 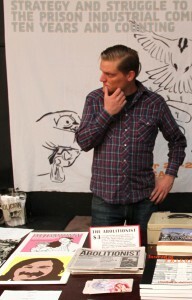 We’ve got t-shirts, tote bags, posters, limited edition prints, stickers and plenty of books about abolition. We currently accept payment through PayPal. Contact us if you would like to make payment by cash or check – goods@criticalresistance.org or (510) 444-0484.